흥선대원군 이하응(1820∼1898)이 입었던 자주색 단령으로 단령은 집무를 볼 때 입던 평상복이다. 겉감은 자주색으로 둥근 깃이고, 안감은 붉은색으로 곧은 깃이며, 넓은 동정이 달려있다. 소매가 넓고 고름은 붉은색과 자주색을 쌍으로 겹쳐 달아서 모두 4개가 양옆에 달려있다. 단령의 가슴부분에는 기린흉배가 달렸는데, 기린무늬는 그의 지위가 대군임을 표시해 준다. 이 흉배는 흑색의 공단에 금실로 정교하게 수놓았는데 기린을 중심으로 아래에는 바위와 물결무늬 등을 수놓고 위의 양옆에는 구름무늬를 배치하였다. 옷의 크기로 보아 대원군의 신체가 다소 작았음을 짐작할 수 있으며 이 유품은 보존상태가 양호하고 기린흉배까지 포함된 완전한 형태로 남아있어 복식연구에 귀중한 자료이다. This purple dallyeong (ceremonial robe) was worn by Yi Ha-eung (Heungseon Daewongun, 1820-1898) as a daily uniform while performing his regular official duties. It has a round collar; the lining is red with a straight lapel and a wide collar strip attached to it. The sleeves are wide. Two pairs of breast ties in red and purple are attached to both sides. 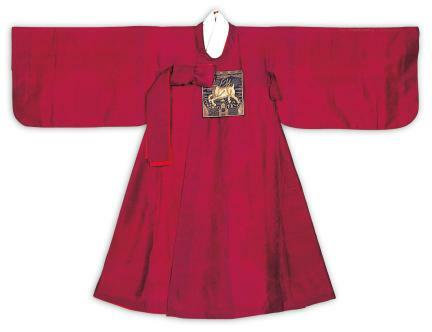 The chest area has a hyungbae (embroidered insignia on an official robe) with the pattern of giraffe to indicate his position as a regent. 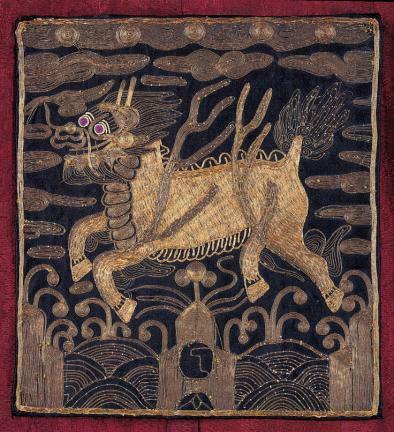 This hyungbae is embroidered intricately with gold threads on black satin silk. Centering on the giraffe, the pattern of rocks and waves is embroidered at the bottom, and the pattern of clouds, on the upper area on both sides. Based on the size of the clothes, Daewongun can be said to have had a relatively small stature. 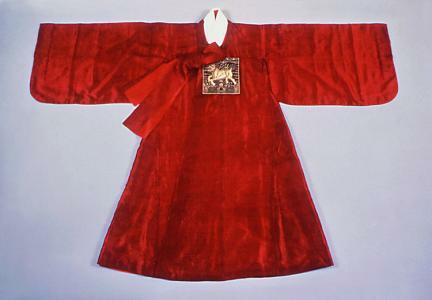 This artifact is well-preserved, and the hyungbae is in perfect condition; thus, it is considered very valuable in studying traditional Korean clothes.